Good day. Here’s another oldie image. Nothing fancy. Maybe even mundane. The flowers appear to me as if they were almost hesitant to get their picture taken. Even with their fiery red color, they seem to want to shrink back into the dark. For me the photo is a bit conflicting -- on one hand the flowers seem to beg for attention but on the other hand they want to be left alone. I suppose one can say the shot is about wall flowers. Growing up I knew what it was like to be one. Maybe that is why I can relate to this image. (I heard that Bruce Springsteen was once in a band called Wallflowers but now I’m totally digressing.) There is really nothing witty about it but I happen to like it. Hope you’ll like it too. 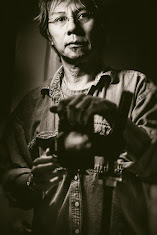 For the camera techie: Taken using Canon EOS 60d at iso 100 using a tripod with a Carl Zeiss 50mm lens at f/16 aperture. I also attached an extension tube so I can get real close to the flowers. The shot was my early attempt with off-camera flash photography. “Off-camera” simply means that the flash is not sitting on the camera shoe but somewhere else. [Why would a camera have a shoe? I am not really sure quite honestly. ] 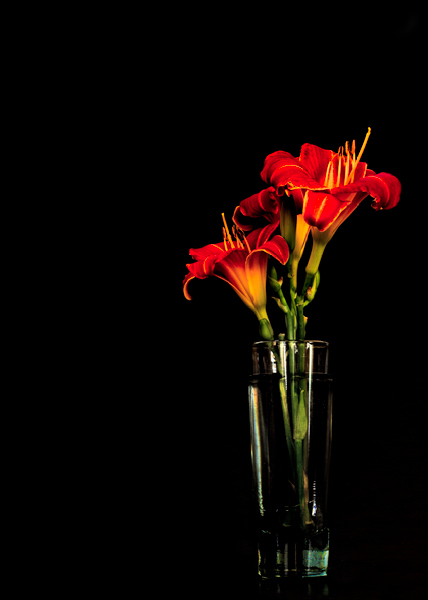 To get this shot, a black cardboard was placed behind the vase as background. The flash was set at the back of the cardboard. The flash merely provided enough rim light so the vase would be discretely illuminated. In other words, the light is really coming from behind. Veronica: I can feel the shyness, yet beauty still shines, no matter how much it tries to hide in the dark. Annie: I like the shot of the vase, it is like you said discreetly illuminated so that only parts can be seen in the picture. I like the black background. It makes such nice contrast to the red lily. I wouldn't call it wallflower. It is too beautiful to be a wallflower. To me the flower is screaming "I am beautiful." P: Pure beauty, elegance, standing together...... Funny how things can seem so different between people. I love this one. And I too was somewhat of a wall flower myself, in a way. I was actually quite shy until I was about 12, then all hell broke loose! Haha Thanks for sharing.